What’s the difference between single-stage and two-stage snow blowers? 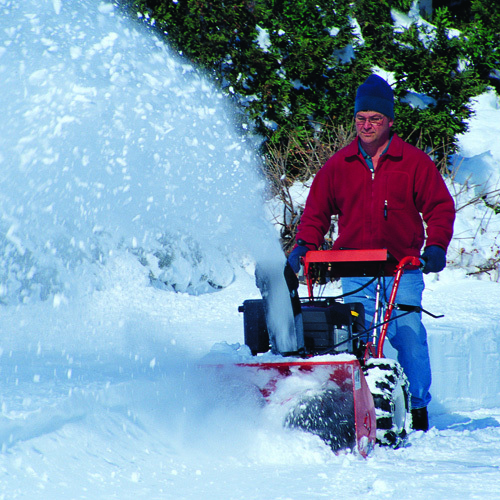 A single-stage snow blower is a relatively small, lightweight snow clearing machine. It uses a spinning auger to pull in snow and then project it out through the discharge chute. Because the auger can only do these two tasks so well, this type of snow blower is best for light snowfall, and will struggle in deep or heavy snow. If you regularly see 3″ to 9″ of lightweight snow, a single-stage snow blower may be all the machine you need. They are lighter, more maneuverable, and less expensive than two-stage machines. Two-stage snow throwers, on the other hand, use a heavy-duty serrated auger to pull snow in and break up chunks of ice (stage one). Then, an impeller launches the snow out the top discharge chute (stage two). Two-stage snow throwers may be a bit heavier and more cumbersome than single-stage snow blowers, but they can take on snow as deep as 12″ or more (depending on the model) and throw the snow much further. Many can throw snow as far as 50 feet. They are also better at navigating steep driveways and walks. If you see deep, heavy snowfall in your area, or if you have a particularly steep driveway or walkway to clear, a two-stage snow thrower may be right for you. Snow blower or snow thrower? The terms ‘snow blower’ and ‘snow thrower’ are often used interchangeably. There is, however, a difference. Technically, a snow blower is a single-stage snow blower, and a snow thrower is a two-stage snow thrower. However, while those are the technical definitions, many people and companies use them interchangeably. 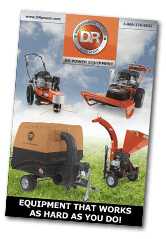 Did you know that if you have a DR Field and Brush Mower, you can switch the brush deck for a two-stage snow thrower? It’s the perfect way to get 4-season utility out of your DR!